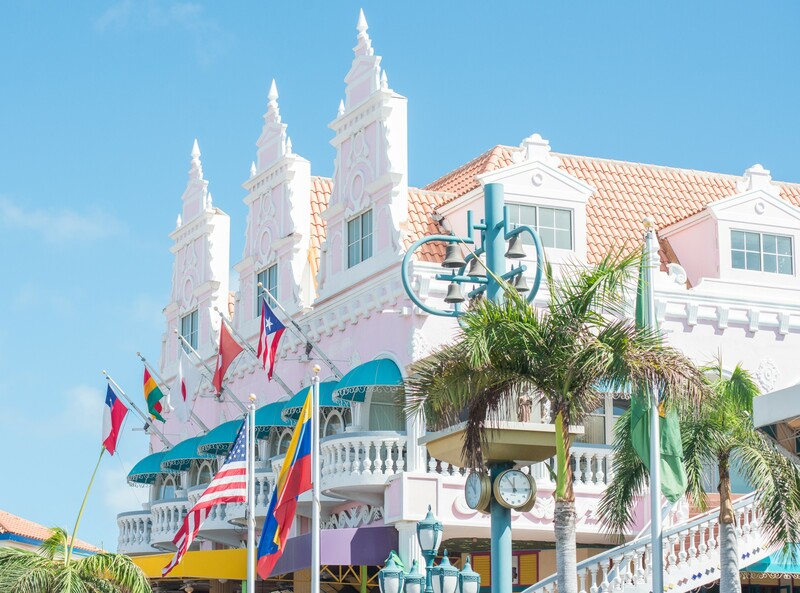 Oranjestad, the island’s original shopping mecca, is livelier than ever. The year 2013 ushered in a new era for the island’s capital with the introduction of the Caribbean’s first streetcar line. Whether it’s international designer brands or quaint one-of-a-kind boutiques—the downtown scene is a shopper’s delight. Parking is available behind the bus station; taxi and bus service will also get you downtown in minutes. You have to pay for parking in Oranjestad, 1 florin for 30 minutes and 2 florin for 90 minutes, there is no limit to extend your hours and after 7pm the parking is free. Regular shopping hours are from 9am to 6pm, Monday thru Saturday, but there are sometimes extended hours when cruise ships are in port. On Sunday and national holidays all stores are closed. 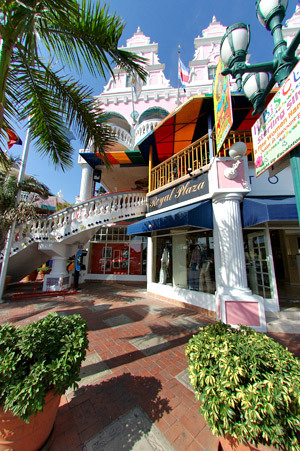 Royal Plaza, located across from the harbor and adjacent to the main bus terminal, has become an iconic landmark in downtown Oranjestad. 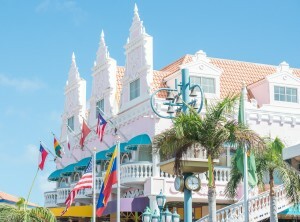 Its signature pink and white Dutch Caribbean architecture houses three levels of shops—featuring anything from fine jewelry and perfumes to cigars and souvenirs, as well as restaurants and an al fresco nightclub. The mall has an elevator and an escalator. Renaissance Mall is home to elite luxury retailers like Cartier, Louis Vuitton, Carolina Herrera, BCBG, David Yurman, Rolex, and Gucci, just to name a few. Duty free perfumes and cosmetics, Cuban cigars, and beach and resort wear can also be found in this indoor/outdoor mall. Upstairs, LG Smith’s Steak & Chop House and The Crystal Casino can be found. Renaissance Marketplace, anchored by the downtown marina, is just across the street from Renaissance Mall. Here, a lively atmosphere prevails in an al fresco venue that features an array of shops, restaurants, outdoor cafes and an outdoor stage with live entertainment nightly. A state-of-the-art cinema complex and the Seaport Casino are also located here. Open daily, from 10 am till 9 pm. Enjoy extended hours at the dining and entertainment venues. Just footsteps away for those staying in any of the high-rise hotels, and a five-minute drive from the low-rise hotels is a shopping and dining district with an exciting ambiance. There always seems to be a buzz in the air—especially in the cooler evening hours, where the streets are filled with strolling vacationers and locals. At the heart of Paseo Herencia is a gorgeous fountain featuring nighttime liquid fireworks choreographed with colorful lights and music, and an amphitheater that showcases a variety of themed events and performances throughout the year. Some fifty shops, a multitude of local and international restaurants, and a cinema complex with six movie screens fill this mall that is dedicated to Juan Chabaya “Padu” Lampe, Aruba’s legendary composer of our National Anthem. 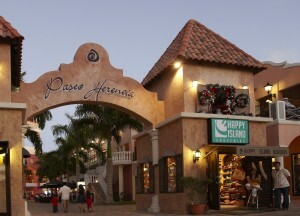 Palm Beach Plaza, located next to Paseo Herencia and a block away from the Holiday Inn Aruba, is a striking three-level outdoor mall, and the largest of its kind in the southern Caribbean. Positioned as more than shopping—it is a family entertainment venue with cinemas, a children’s entertainment center with a supervised playroom, activities and a rock-climbing wall, a bowling alley, a gourmet fast-food court, fine dining restaurants and a multitude of shops and boutiques. The Village, located in the heart of Palm Beach, is a colorfully captivating collection of stylish shops and restaurants. 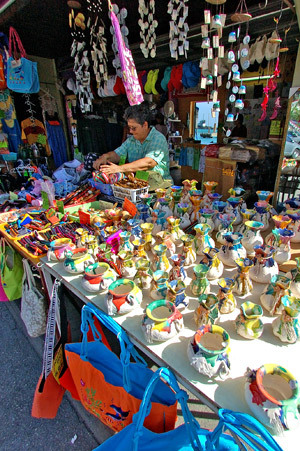 During the evening hours, the courtyard bustles with souvenir and local crafts for sale in a festive outdoor market setting. The Village has several popular nightlife bars and clubs that stay hopping into the wee hours. There is convenient parking, and taxis are abundant. South Beach Centre set the pace a few years ago, ushering the Palm Beach area into a lively district for shopping, dining and entertainment. Anchored by the Hard Rock Café Aruba, this outdoor plaza comes to life after dark. In addition to gift and souvenir shops and kiosks, South Beach Centre has a diverse dining scene, tempting palates with sushi, Lebanese cuisine, Dutch cafes, Chinese and Japanese cuisine, Indian fare and a chic outdoor lounge with nightly live music. Parking is convenient and ample. Alhambra Casino & Shops is the island’s newest shopping and dining destination. The breezy outdoor plaza invites visitors to stroll amongst an array of unique boutiques offering resort and swimwear, souvenirs and gifts. A large coffee shop with al fresco seating, pizza, ice cream and sandwich shops, a gourmet mini market and a contemporary Asian bistro make up the plaza’s culinary offerings, and a chic tapas and piano bar infuse energy into the nightlife scene.